Dr. James is a graduate of Booker T. Washington High school and Norfolk State University. After some time in the retail work force, she decided to continue her education. Pursuing a long time interest in health care, she graduated from Howard University's College of Dentistry in 1996. Dr James' first position was part-time with Portsmouth's Dept. of Health. Then, for the next nine and a half years, she worked full-time for Correct Care Solutions at a local correctional facility. 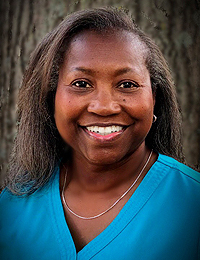 After careful thought and a lot of prayer, Dr.James then opened her own practice Artful Smiles Family Dentistry. This allowed Dr. James the opportunity to practice the full range of dental treatment and for all ages. Dr. James has been enjoying treating patients for the past twenty years. She looks forward to continuing to do so.